For 2017, Specialized revamped its women’s offering, swapping the Rumor–a short-travel 29er and 27.5 bike–for three ladies’ models of its popular Camber platform. This makes sense, given it had already updated the Camber last year and the Rumor was due for an overhaul. It’s also reflective of brands’ overall shift toward eliminating bikes with women’s-specific geometry, one of which was the Rumor, in favor of outfitting existing frames with parts designed for smaller riders and, usually, adding an XS frame size into the line. Of the 11 Camber models Specialized makes, it opted only to offer the 27.5-wheeled versions of the 130-millimeter-travel trail bike specifically for women. Of course, nothing is stopping anyone from buying the non-women’s models–as long as you don’t need an XS–which is what I would do since I’m partial to 29ers in this category. That aside, the women’s version of the Carbon Comp 650b rode well on the steep, root-filled trails around Whistler, where I tested the bike during the Crankworx festival, if only slightly under-gunned on the rowdiest sections of Comfortably Numb, an advanced XC trail littered with slab rollers and roots. The Camber uses Specialized’s nifty Autosag system to guide rear-suspension setup for the women’s-tuned Fox Float Performance shock. To do this, you pump the shock up to 300 PSI (a high-volume shock helps here), then sit on the bike and hit the release valve on the shock. Presumably, this should set the appropriate sag for your body weight. After going through the quick process, I eyeballed the sag indicator and it looked right at about 20 percent, but out on the trails the bike felt firm, and I ended up needing to let more air out of the shock. After using Autosag on several different Specialized bikes, I find that I usually have to adjust the sag once or twice once I start riding, but the process provides a good starting point. The Comp Carbon is on par in price ($3,800) with the unisex model, but there are some subtle changes to the parts on the women’s model including a narrower handlebar–a 720-mil Specialized alloy Mini-Rise versus a 750-mil–a women’s-specific saddle and a smaller front chainring. Specialized opted to spec a 28-tooth front chainring for the SRAM one-by drivetrain, as opposed to a 30-tooth on the non-women’s model. 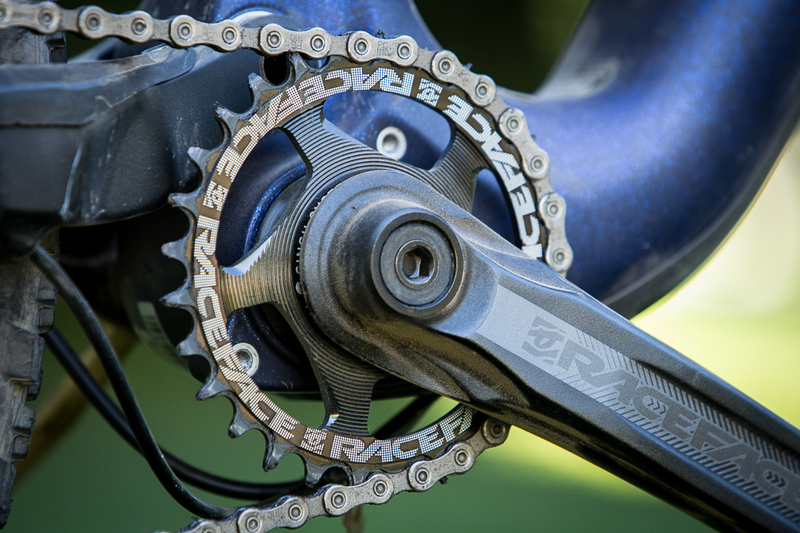 When paired with the 10-42 rear cassette, the slightly smaller front chainring provides plenty of gearing for climbs and will cause only the occasional spin-out on fast, fire-road descents. 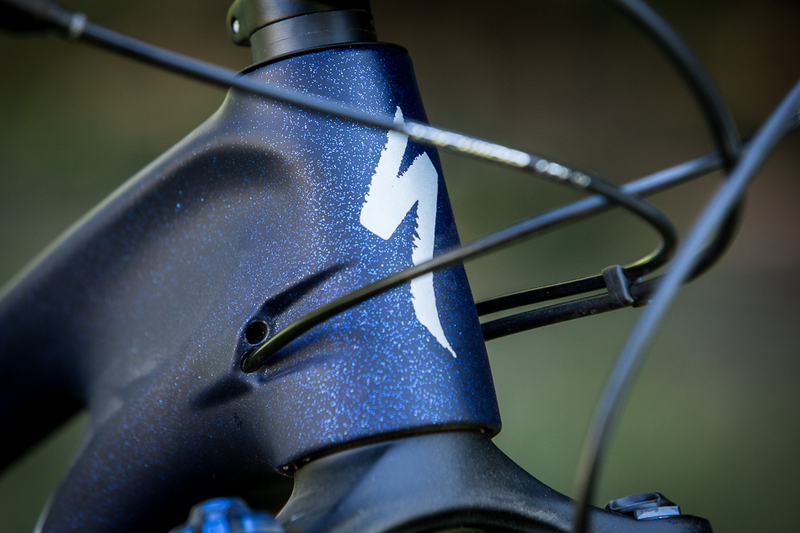 The women’s Comp Carbon also gets a fancy, sparkly blue matte paint job. A 28-tooth front chainring makes climbs a breeze. I started my ride on the Camber on Whistler’s Lost Lake trails, a mellow XC network that winds through the forest, with some wide bridges and a few rock gardens to spice things up. The bike felt good climbing almost immediately, with its trail-appropriate 68-degree headtube angle keeping the front wheel planted. Later in the day on Yummy Numby, a 1.4-mile climb that rises 700 feet over a mix of smooth singletrack and successive roots, I yearned for a 29er at times and its ability to roll up and over obstacles. The 27.5-inch wheel required a bit more coaxing to get over taller roots, but the excellent traction provided by the 2.3-inch Ground Control rear tire prevented the bike from slipping as I shifted my weight forward to power up technical climbs. I took the Camber on a couple classic Whistler Valley descents, including Cut Yer Bars and the 3-mile foreplay section of Comfortably Numb (or ‘Uncomfortable Bum’ in local speak, which should indicate the trail’s characteristics), the latter somewhat nervously, as I’d heard its technical nature may be fitting of a bigger-travel bike. But the Camber used its 130 millimeters of travel well, and once I committed to the lines down the small slabs, occasional ladder bridges and root snarls, all of which rolled, the bike didn’t hesitate. On a few high-speed, rocky sections, though, the bike’s front end felt overwhelmed and I rescued a couple of close front-wheel washouts, an issue that a slightly stouter fork–one that rides higher in its travel–than the stock Revelation would likely remedy. Keep in mind that ‘trail’ riding in Whistler could be considered fairly aggressive by many standards, and the Camber will no doubt excel as a do-it-all trail bike in places where it’s not normal to see tots on push bikes testing their courage on the XC trails. The Comp Carbon’s complete package includes a carbon frame with alloy rear triangle with a ‘S.W.A.T.’ door cut into the downtube, which opens a portal to storage for tubes, tools or whatever you deem worthy. I stuff a hand pump, tube and a bar or two in there so I know I can always fix a flat and have a snack while I’m doing it. The drivetrain is a mix of SRAM GX and NX parts, brakes are Shimano Deore and wheels are alloy Roval Traverse with a 29-millimeter internal width. 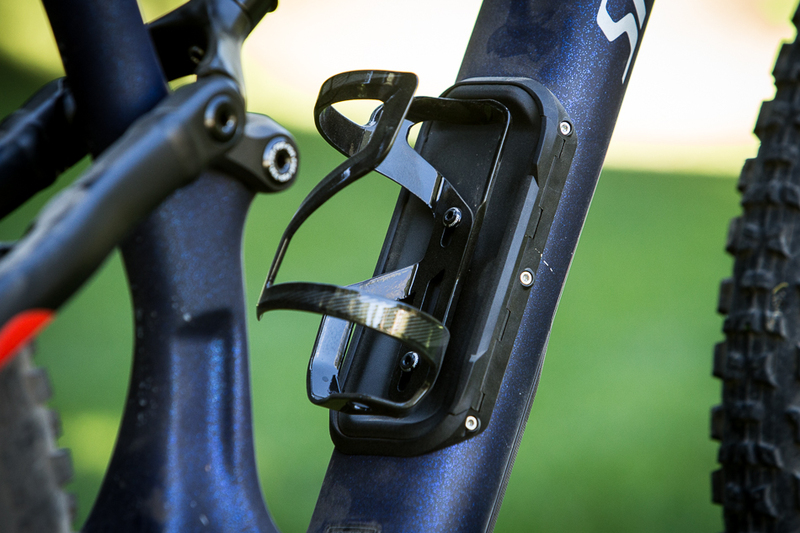 The seatpost is Specialized’s Command post with a 125-mil drop (small frames come with 100-mil drop and XS with 75-mil). Unfortunately, the Command doesn’t yet come in a 150-mil drop version, but if it did, that would be one of my first swaps. A longer travel post goes far in coercing your body into optimal descending position. At $3,800, it’s a pretty good deal for a carbon trail bike–and Specialized also offers the Comp at $2,500 and the Camber at $1,900, both with alloy frames–but it would be nice to see the company market a higher-end Camber version to women as well, as there are Expert, Pro and S-Works models available in the unisex models.